Clients use our analytics dashboards to monitor the state of the grid, by keeping track of outages, the number of jobs completed, etc. But did you know that the same analytics can also be used to monitor internal systems? The following example monitors one or more servers in the client’s network, in this case the Atlas servers. 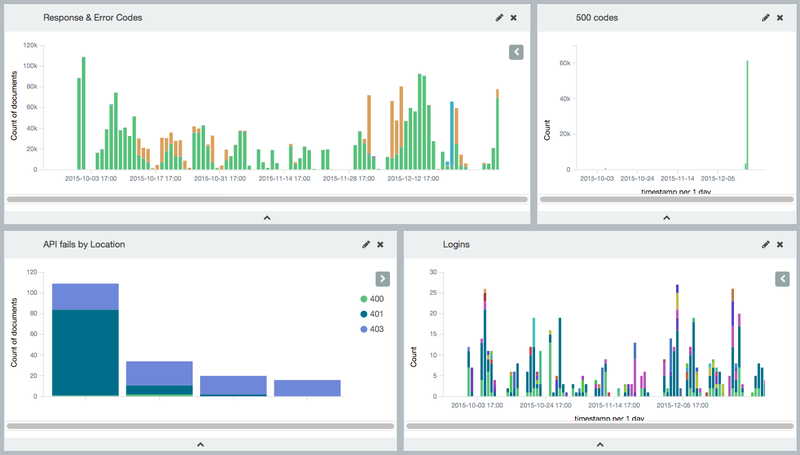 With a single dashboard, administrators can monitor the health of the server(s), successful and unsuccessful access attempts, including location and network traffic. Example 1: (See image) When the Atlas client apps try to authenticate themselves but fail, the server responds with a 400, 401 or 403 error code. When this happens once it might just be a case of the wrong password, but when it spikes and originates from an unknown location, it is most likely not legitimate. Administrators can then take steps to block access. Example 2: (See image) We simulated a “disk full” resulting in a 500 error code. Since there should never be 500 codes, we can set an alarm to inform system administrators to check on that server. The above examples demonstrate that our analytics dashboards can be used to monitor both the grid, as well as internal support systems used to run the grid, including Atlas itself. The dashboards are available on all desktop browsers and also on iOS and Android tablets running the native Atlas app.